DARLINGTON, S.C. – Kyle Larson utterly dominated Sunday night’s 69th annual Bojangles’ Southern 500 and appeared to be well on his way to his first Monster Energy NASCAR Cup Series win of the season. Larson swept the first two stages, led a race-high 284 of 367 laps with his No. 42 DC Solar Chevrolet and was out in front by as much as 17 seconds at one point during NASCAR’s most grueling race. However, when it came down to crunch time, a bumper width at the exit of pit road was the difference between certain victory and heartbreaking defeat for the Elk Grove, Calif., native. Larson was edged out by Brad Keselowski during the night’s final round of pit stops with 22 laps left. He came in as the leader but left second and lost the advantage of being the control car for the restart. When the green flag waved with 19 to go, Keselowski shot out like a cannon and never looked back, while Larson faded in dirty air and eventually lost second place to Keselowski’s teammate, Joey Logano. After settling into third, Larson held off Kevin Harvick for the final 15 circuits to earn a podium finish, but the race-long dominator was visibly disheartened at missing out on what would have been the biggest victory of his NASCAR career. Even still, Larson realized that Sunday night’s performance was a huge boon for his team, which has struggled somewhat through the summer months but has rebounded in a big way over the last two races. Sunday night marked the fourth time in his Cup Series career that Larson led more than 200 laps in a single race, with his 284 laps led setting a career-high single-race mark for him. In all four of those races, Larson failed to come home with the trophy, something that he admitted afterwards does eat at him a bit. “It’s tough to swallow, when you have a car that good,” Larson said of not winning. “The whole time I was just praying for long runs. I didn’t want to see those last couple cautions I was out front, because I knew it could shake things up. We had some good pit stops throughout the night, but our car was so good on long runs and I just wanted it to stay green. Despite all the heartbreak, Larson did have reason to smile at the end of the night. Between he and Xfinity Series teammate Ross Chastain, Chip Ganassi Racing won all four stages during the Darlington weekend and led a combined of 374 of 514 laps run at the 1.366-mile oval. 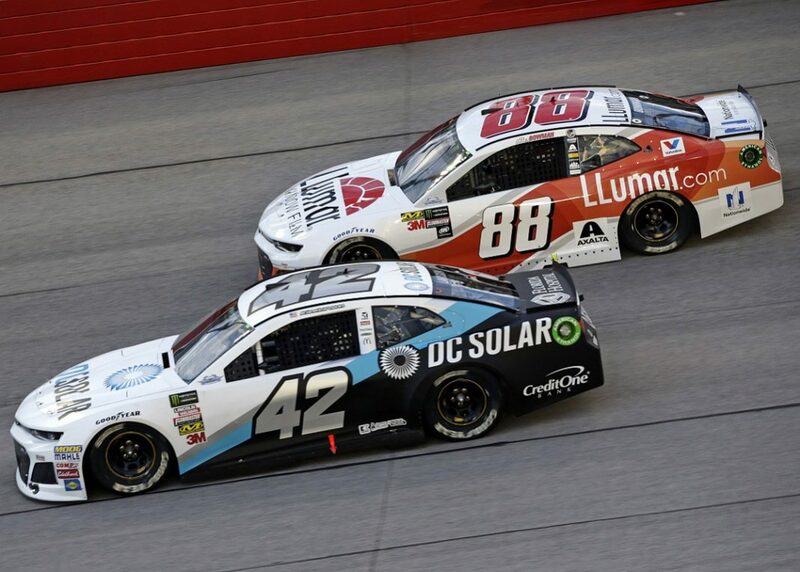 While Larson wasn’t sure specifically what contributed to the team’s uptick in performance at a track they’ve historically struggled at, he wasn’t complaining about it, either. “I don’t know what it was, but it was cool to see both cars like that, leading a bunch of laps,” said Larson. “Both Ross and I kind of had disappointing results, but Jeff and Paulette Carpoff with DC Solar … they love racing and to put on some good runs for them this year is really cool. At the same time, though, coming up short like we have a lot of times with their brand on our car is disappointing.